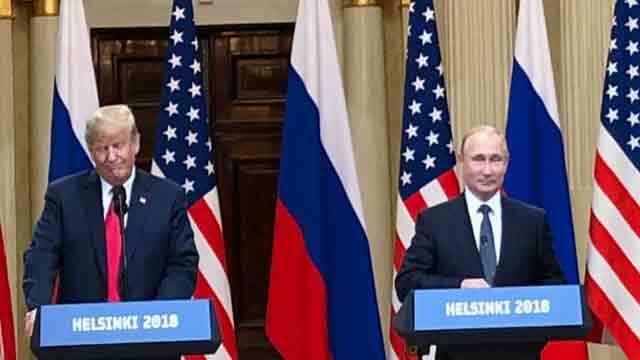 Helsinki, July 16 (Just News): President Donald Trump on Monday said at a joint briefing with Russian President Vladimir Putin that while he had "great confidence" in the U.S. intelligence community, Putin was "extremely strong and powerful in his denial" that Russia meddled in the 2016 U.S. presidential election. The president blamed "both countries" for the strained relationship. When a reporter asked the president if he would denounce Russia's efforts to interfere in the presidential election, Trump raised the issue of Hillary Clinton's email server. "I think it's a disgrace we can't get Hillary Clinton's 33,000 e-mails. I have great confidence in my intelligence people, but I will tell you that President Putin was extremely strong and powerful in his denial today," Trump said. Putin told Trump during the summit Monday that he never meddled in the election. At the briefing, Putin called the allegations "nonsense," and offered to allow special counsel Robert Mueller's investigators into Russia. "The Russian state has never interfered and is not going to interfere into internal American affairs including election process," Putin said during the briefing alongside Trump. Putin said that he was willing to work with the U.S. to "analyze together" any specific material related to election meddling. He said that he would allow Mueller's investigators into Russia on the condition that the investigation would be a "mutual effort" in which Russian officials could also interrogate U.S. law enforcement officers "who have something to do with illegal actions on the territory of Russia." The Russian leader also said the two discussed their "responsibility for maintaining international security" citing their respective nuclear weapon arsenals. "It is crucial that we fine tune the stability and global security and nonproliferation of weapons of mass destruction," Putin said. "We submitted to our American colleagues a note with a number of specific suggestions and we believe it is necessary to work together to interact on the desired agenda, military and technical cooperation." "My sense is very little was agreed on other than to keep talking on a number of issues," Olga Oliker, director of the Russia and Eurasia Program at the Center for Strategic and International Studies, said on Monday following the briefing. Harry Kazianis, director of defense studies at the Center for the National Interest, said there was a long way to go to restore trust in the U.S.-Russian relationship. Still, he said, there is a positive takeaway. "The good news is both sides, who hold over 90 percent of the world’s nuclear weapons, are talking and that has to be a good thing," Kazianis told CNBC. The two leaders "spent a great deal of time," talking about election meddling, Trump said at the briefing. Trump repeatedly denied that there was any collusion, saying at the briefing that "there was no collusion at all." "There was no collusion. I didn't know the president. There was nobody to collude with," Trump said. He added that he beat Hillary Clinton "easily." Trump has faced pressure to address Russia's meddling in the 2016 U.S. presidential election. That pressure reached a new high on Friday after Mueller indicted 12 Russian government officials, accusing them of hacking into computers belonging to Clinton and the Democratic National Committee. "I think the probe is a disaster for our country," Trump said at the briefing, referring to Mueller's investigation. When asked if Putin would extradite the 12 Russian intelligence officers to the U.S. to face charges, the Russian leader said at the briefing that he did not know the full extent of the issue, but offered to have the 12 officials interrogated. Putin also addressed allegations that Russia had collecting compromising material on Trump when Trump visited Moscow in 2013. "I did hear these rumors that we allegedly collected compromising material on Mr. Trump when he was in Moscow," Putin said. "I treat President Trump with the utmost respect but back then, when he was a private individual, nobody informed me that he was in Moscow." Putin also said that he did favor Trump against Clinton in 2016. "Yes, I did," Putin said. He said Trump was his favored candidate because he "talked about bringing the Russian relationship back to normal." In his first comments after the meeting, Trump told reporters he believed the summit marked a "very good start." "I think it’s a good start, a very, very good start for everybody," Trump said, speaking in the palace's Hall of Mirrors immediately following the meeting. Earlier Monday, Trump predicted that the two leaders would have an “extraordinary relationship." The president said they would discuss “everything from trade, to military, to missiles, to nuclear to China." The summit between the two leaders — their first in a formal setting — followed a contentious week in which the president slammed NATO allies for what he has called inadequate defense spending, threatened to "kill" a trade deal with the U.K., and called the European Union a "foe." The series of events has prompted outcry from America's allies, including Germany, one of America's largest trading partners. Germany's foreign minister Heiko Maas told a German newspaper group on Monday that the country "can no longer completely rely on the White House." "While the summit talks that just concluded in Helsinki were described as 'deeply productive', there is clearly a long-way to go to build any sort of trust between Washington and Moscow, if ever," Kazianis told CNBC. "Will we be talking about meddling? I will absolutely bring that up. I don't think you'll have any, 'Gee, I did it, I did it, you got me.' There won't be a Perry Mason here I don't think," Trump said. Putin provided Trump's negotiators with a list of "specific suggestions" related to nuclear disarmament, the Russian leader said Monday. 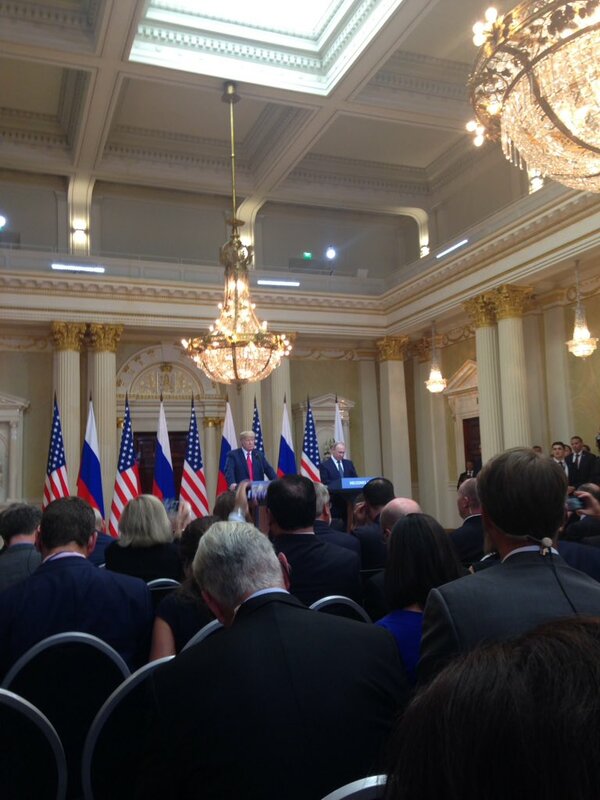 "Today, negotiations reflected our joint wish with President Trump to redress this negative situation in a bilateral relationship," Putin said, saying the U.S. and Russia bore a "special responsibility" as major nuclear powers. The president has said that he would improve the United States’ relationship with Russia. Though, in a post on Twitter on Monday, the president wrote that the relationship “has NEVER been worse."